Everyone who schedules meetings knows the pain associated with constant back and forth on timing, location, and details. One person reschedules, the next one can’t meet at any reasonable time, and finally there’s the person who just doesn’t get back to you. Instead of hiring an assistant or taking the time yourself it’s time to use x.ai. Simply CC ‘Amy’ or ‘Andrew’ in your email and the company’s AI technology will schedule the time and place for whatever the meeting calls for based on your preferences. The service has gained significant traction while still in beta and is happily being used across a number of industries. Today we chat with Dennis R. Mortensen, CEO and cofounder of our favorite AI application, about details on the company’s newest round of funding and what’s in store for Amy and Andrew. 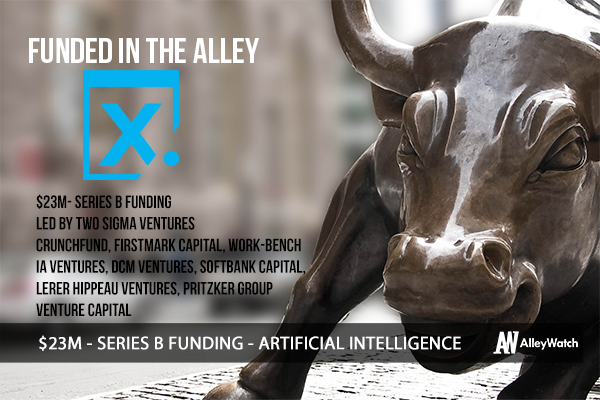 Two Sigma Ventures led our Series B financing. In addition, DCM Ventures and Work-Bench Ventures joined as new investors. All of our existing investors also participated in this round. We raised ~$23 million. We make an AI personal assistant who schedules meetings for you. We’re building invisible software, which means there’s no sign-in, no password, no download. You CC amy@x.ai into your email thread, just like you would a human personal assistant. Amy then takes over the tedious email ping-pong that comes along with scheduling a meeting. Pain. In early 2013 I sold my prior company (Visual Revenue) to Outbrain. I had a bit of time on my hands, so I decided to count up all of the meetings I had scheduled in 2012. It turns out I scheduled 1,019 meetings—by myself, usually at night, over a bowl of cereal—in 2012. Worse, I rescheduled 672. It struck me that we’ve been scheduling meetings the same way for twenty years, via email. And it doesn’t work very well. It takes on average 17 minutes and 8 emails to get a single meeting onto your calendar. My hunch was that we were at a point that an AI agent could take over this job from start to finish. Amy (and her twin brother Andrew) schedule meetings for you, just like a human assistant would. You hand over that job to her, and you don’t hear from her until she has successfully negotiated a time and location for your meeting. Other solutions keep the user involved in the process. To us, that’s not acceptable. We want to remove 100% of the pain of scheduling meetings. 87 million knowledge workers in the US schedule about 10 billion formal meetings a year. We want Amy and Andrew to schedule every single one of them. We are SaaS, think Slack or DropBox, and you can expect to see typical SaaS pricing when we roll out our Professional and Business editions this autumn. What’s the one area people are saying needs improvement? In our closed beta, we’ve only supported Google Calendar but we know that we’ll need to support Office 365 and Outlook as well as other calendars. We are working hard on those integrations. Raising capital is always tough, but we had a few reasons to be optimistic. One is that our existing investors were committed from the start. Another is that our beta customers love Amy; we often hear from them directly, and many Tweet their adoration. We’ve also assembled a stellar team of smart, dedicated folks across data science and engineering. Finally, given this isn’t my first venture, I knew I’d have to do upwards of 100 meetings with investors to find a perfect fit with that handful of firms who wholeheartedly believe in our vision and aligned around terms. No magic applied, just hard work! We don’t look like your typical 2016 software company. We’ve been building Amy for more than 2 years now, and haven’t yet released our premium editions. This is odd for a Series B financing. Usually, at this stage, you’re seeing substantial monthly recurring revenue traction. There are a few reasons: The first is product market fit. Most of us who have to schedule our own meetings would hire a personal assistant to take over that job, if we could, but we can’t because we can’t afford the $50K in cost. The second is all that customer love I mentioned. People love Amy so much that we constantly get asked when they can start paying us. Third, the team we’ve assembled is extremely accomplished, and if anybody is going to solve this, it’ll be us! Finally, we see this as a winner take all market, which perhaps speak to winner-takes-most opportunity as well, which is a real VC turn on. They key milestone is rolling out our Professional and Business editions come autumn. Stay focused. We do one thing and one thing only: schedule meetings. It’s easy to get distracted especially if you have some early customers clamoring for features or potential partners. You have to figure out the one thing you can excel at and relentlessly drive towards that. We will continue training Amy and Andrew so that they can schedule meetings flawlessly. We’ll also extend her skills by enabling her to book meeting rooms, treat some of your guests as VIPs, and send you a Daily Agenda to remind you of each day’s meetings.